If brewing excellent beer is a crime then Crime & Punishment is guilty. What a wonderful surprise C&P was. I had heard good things about the brewpub but still didn’t know what to expect. Located in Brewerytown – Yippy beer is finally being brewed again in Brewerytown – Crime & Punishment is nestled among a various row of storefront businesses and can easily be passed by. Seek it out! It’s much smaller than I imagined and laid back which made me very happy. For some reason I thought it might be more of a hoity-toity place but was pleased it’s really has the atmosphere conducive of kicking back with some friends or making new ones like this Gal did on my recent visit. Offering a very down to earth welcoming vibe and a staff that’s outgoing, knowledgeable and a pleasure to talk to. The tap list consists of 7 diverse beers available in full or half pours. Flight aren’t available but if you go for half pours and have a friend with you willing to share a taste or two of their beer you have the list covered. The food menu has something for everyone as well and leans towards the ethic character of the neighborhood with homemade dumplings and locally produced meats. It’s surprising what quality homemade food they are serving considering the tiny size of the kitchen which is located behind the bar. It’s local artisanal at it’s best. How good is the beer – REAL GOOD. So much so that the God-father of the Philly Beer Scene sat down on the stool next to this Gal and enjoyed a couple of C&P’s finest selections. I for one was impressed with diverse selections from a Beet Beer (yes, beets) to an AMAZING English Brown Ale. My friend and I decided to approach the list in a way so that we could try all the beers and I could still be responsible to drive back to NJ. Key was tastings, half pours and food. We started with one of the 3 food specials of the day a meat, cheese & pickle plate which complemented the Disturbing the Beets American Wild Ale and Bad Haircut English Brown Ale perfectly. For the next food pairing we ordered the Farm at Doe Run Cheese Plate with the 100 IBU’s to Life IPA and the Nightingale the Robber English Barleywine. Both beers matched nicely with various cheeses on the board. However, the match up of the Nightingale and the creamy cheese and honey was outstanding. The final pairing for this Gal was the Behemoth Oatmeal Stout – you know I had to go for the stout – with the homemade Mushroom Pelmeni. 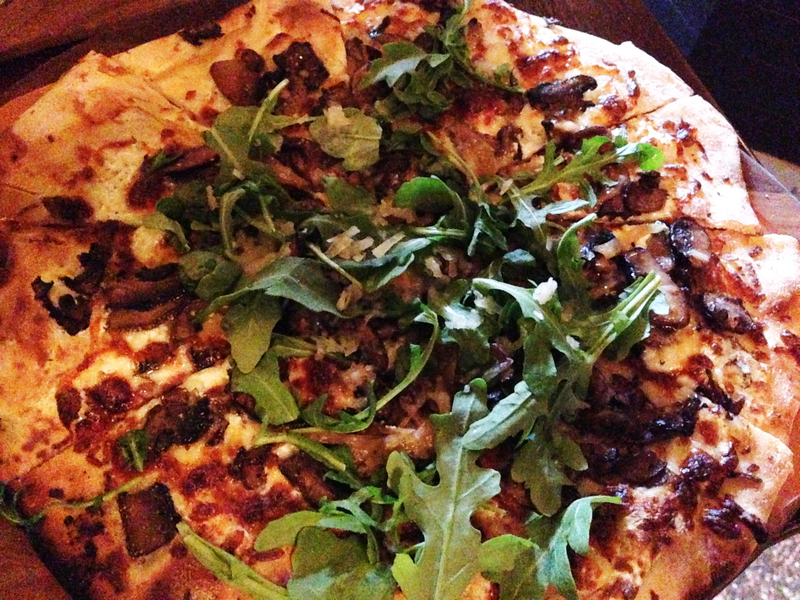 The richness of the stout and the earthiness of mushrooms were made for each other. My friend went for the homemade Pork & Beef Pelmeni and the Bad Haircut English Brow Ale which made for attractive match. No worries I also had taste of the Indecent Exposure Pale Ale and the Baikal Insurrection. The beers shine on their own or go great with the various C&P food selections. One can tell a lot of thought goes into both menus at Crime & Punishment so that the best of the old and new world combine to create a community of amazing flavors. C&P is a 7 barrel/8 tank system and shortly will be distributing to 3 Philly Bars including one of Brendan Hartranft establishments. C&P with one of Brendan’s bars is a match made by the beer gods. For only being opened 8 months or so Crime & Punishment has an amazing establishment with a strong following that’s growing daily. The only crime would be for you to miss out on enjoying the fine beers and delightful food they have to offer. The beets are present but the sourness meshes to keep the beets from overwhelming. Bonus you feel healthy while drinking it! Yes! So happy to see a Brown Ale on tap. Love this style and C&P brews a fantastic rendition. Great coffee nose and combo of bitter and malts leaves you feeling more than satisfied. Yup, this Gal went for the IPA and thoroughly enjoyed. I find IPA to be one of the best beer styles for pairing with various foods. The West Coast hops let themselves be known and enjoyed while the malt helps tone them down so you can taste all the other wonderful complexities of the beer. Soft velvety mouthfeel with cocoa, fig and the roasty bitterness this Gal loves. I heard someone say it’s not Barleywine season?! Get over it you can drink them anytime of the year and am glad to see one still on the menu. Besides it’s still March perfect time for a barleywine and the Nightingale is one to savor and enjoy. Has that great underlying whiskey tone with subtle hints of butterscotch and earthy goodness. Loved this and wish I could have had more than a taste but at 10.2% it wasn’t meant to be, at least not on this visit. The yeasty maltiness with hints of dark fruits and toffee undertones combined to make a very enjoyable Strong Dark Ale. 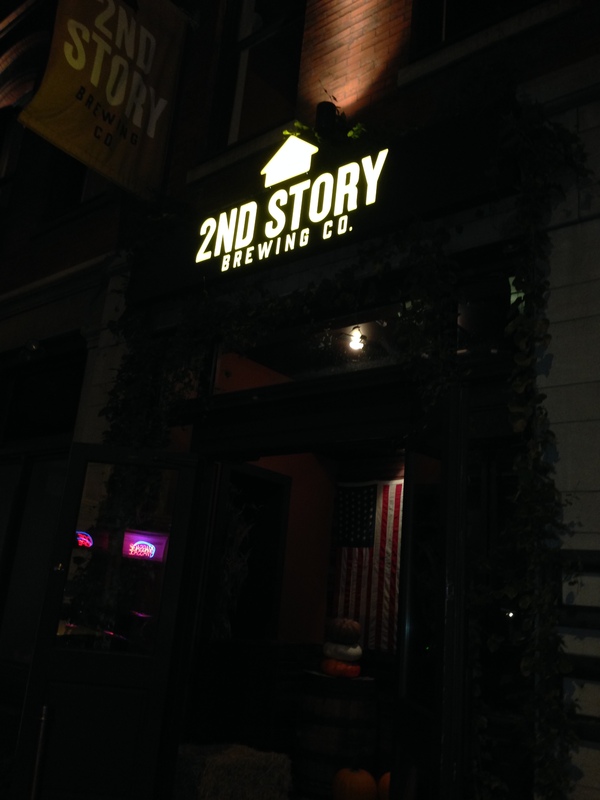 2nd Story Brewing Company is a welcome addition to the Philadelphia beer scene and with so many great beer options in the city of Brotherly Beer to choose from you might skip over one of the newer kids but I recommend you stop and check them out. 2nd Story has a rustic industrial feel to it with a long bar that takes up most of the wall to the right and multiple sitting areas throughout the downstairs. Something I absolutely loved (besides the beer) is the space between tables. Yes, the owners could have fit in several more tables but instead chose to leave lots of breathing room between tables which gives each group/table a sense of privacy. Such a welcomed retreat from overcrowded dining areas. Story. ; ) There’s also a smaller bar and some dining table upstairs which makes for a perfect spot for a private party. On this particular night the area was empty and all the action was taking place on the main floor including a birthday celebration for a special someone – my awesome nephew! So happy my brother chose 2nd Story to celebrate his son’s 23rd birthday at. 2nd Story is a full service restaurant/bar with a diverse and tasty food menu and excellent service provided by Kelly. 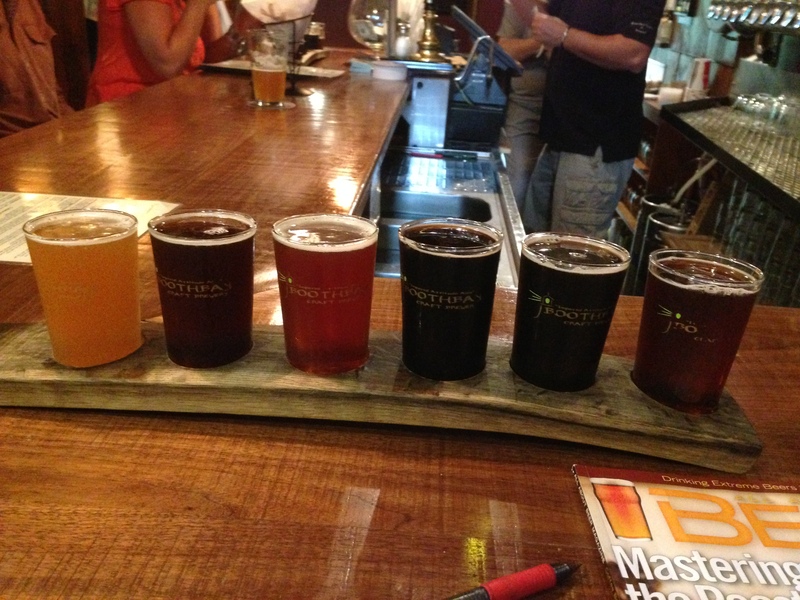 The beer selections are diverse as well and really offer something for everyone’s beer taste. During this Gal’s visit there were 10 beers on tap and one can do a flight of 4 5 oz pours for $8.50 (pints and growlers are also available) Naturally, this Gal chose to go with a taster round. Who Dunnit American Pale Ale 4.5% Hops, with odd after taste, sort of a dank funkiness mixed with herbs. One can taste the cascade hops in this nicely brewed ale. More and more this Gal is enjoying wet hopped beers. Sour German wheat beer with a good amount of tartness that is counterbalanced by a saltiness. You have a choice of it being served with raspberry or pomegranate syrup. A true classic Oktoberfest beer with earthy and sweet malts, hints of toffee and hops. After the taster round was drained and the dinner consumed the group chose their dessert choices. Dessert for this Gal was a full goblet of Great Pumpkin Porter. This is a great combo of pumpkin spices, malt, vanilla and hints of a rum flavoring. Very clean, smooth and subtle pumpkin. The house-made doughnut dessert is served with a small taster of the this porter and compliments the dessert nicely. Yup, lots of hops and rightly so. Although, the honey helps to balance the hops. 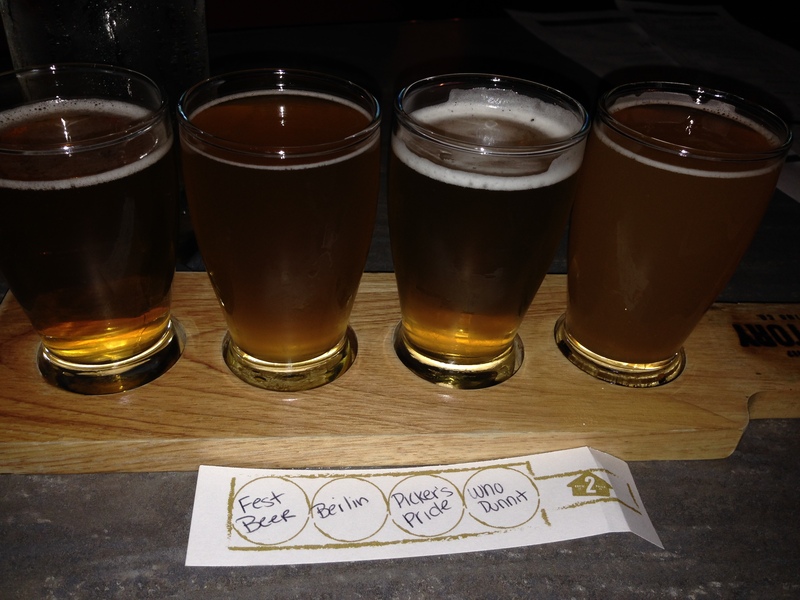 Overall 2nd Story Brewing Company is a great addition to the Philly Beer Scene. Located in Old City one could easily make it a stop on a beer crawl since it’s located across the street from Eulogy and around the corner from Khyber Pass. This Gal just loves when little out of the way gems are discovered and Liberty Craft Brewing is just that a hidden gem. 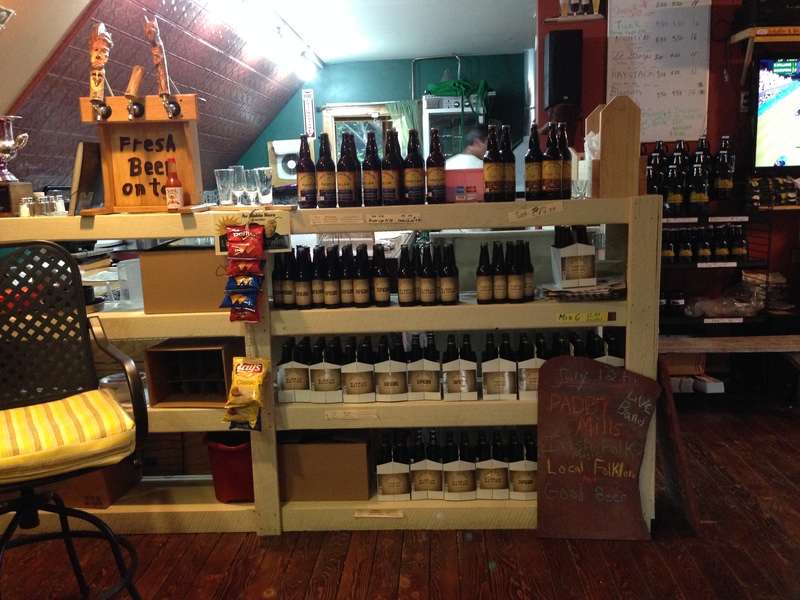 This tiny brewpub is located on the brewer’s proberty above the garage which serves as the brewery. 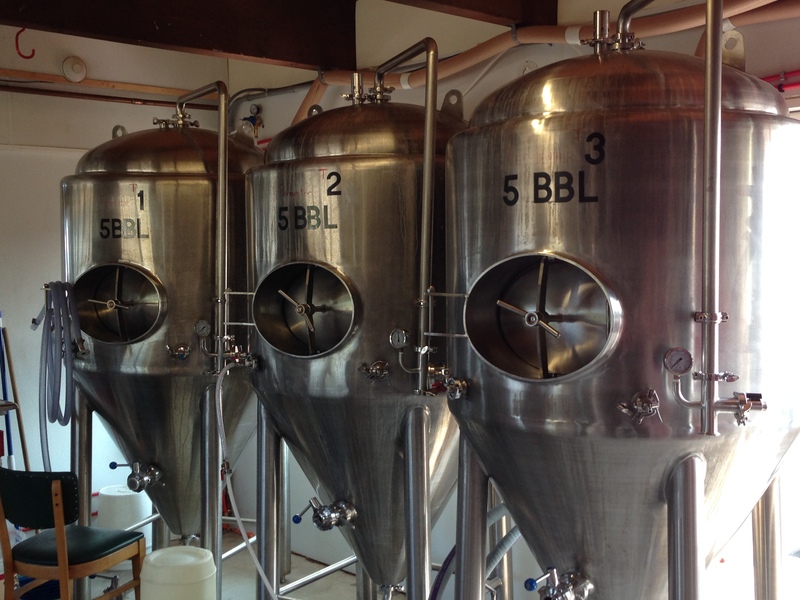 They brew 100-150 gallon batches, 1 batch per week. 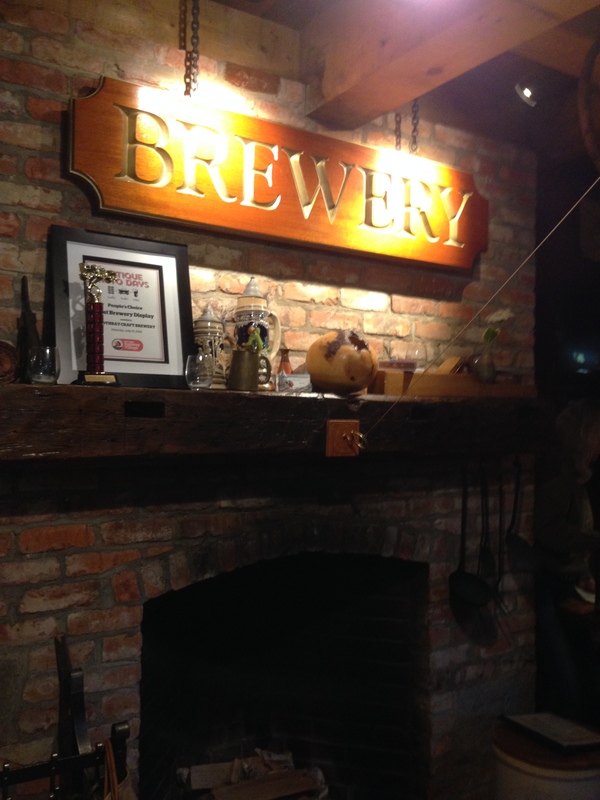 The brewpub itself is small with lots of wood, a bar that seats 5 and 2 tables inside with a total capacity of 15. There’s seating outback on the deck too and it just happens to offer an amazing Maine view. Occasionally, they have live music although, I have no clue where they fit a band and for a few of the regulars there’s an exclusive mug club. This is truly a brewpub in that it serves both beer and food. Like the rest of Liberty Craft Brewing the food menu is small but but there’s something for everyone including a couple of vegetarian options. 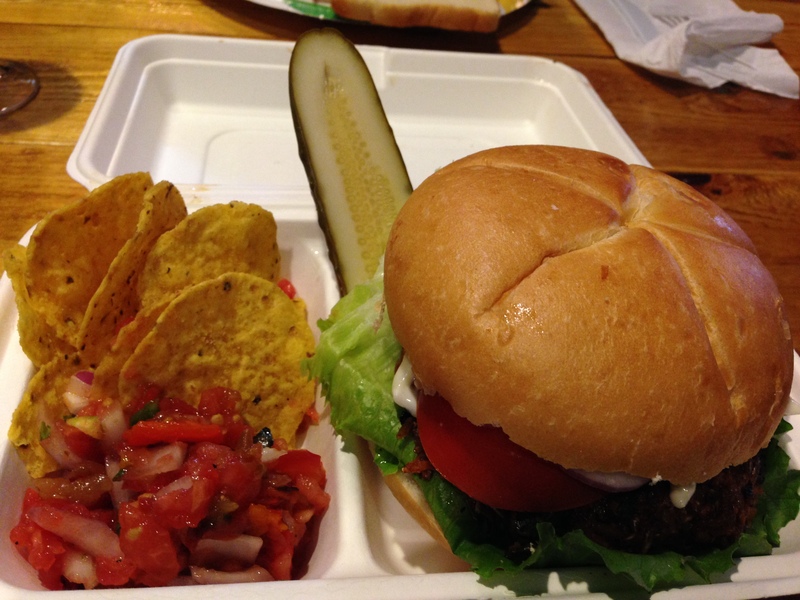 This Gal opted for the homemade malted grain veggie burger which happens to be made using grains from brewing. It was fantastic and if your wondering yes, you can taste the grains which are delicious. My bro had the bratwurst which comes from Morse’s European Market down the street. Another must stop if your up that way. 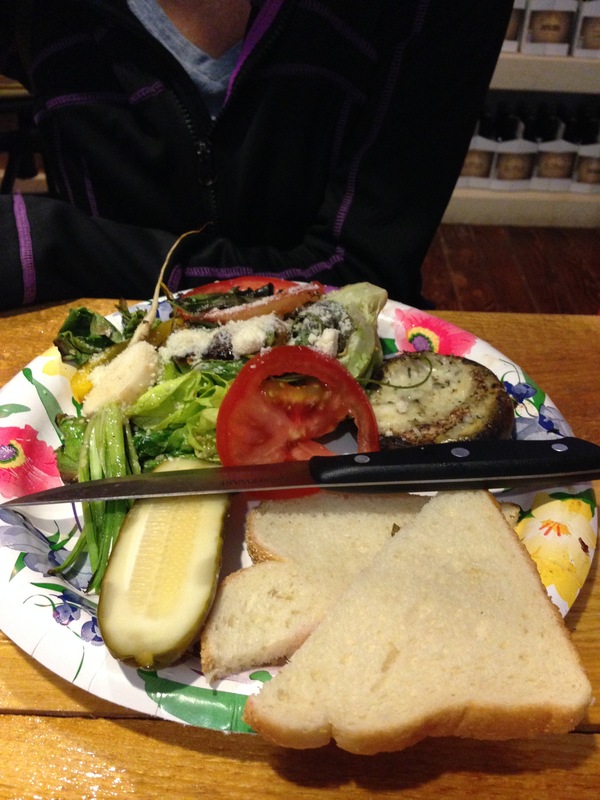 Other food items the group enjoyed included a roasted veggie salad with a stuffed mushroom and lamb/veal gyro. All served with a side of house made salsa which is awesome and offers a nice little kick. Now on to the BEER! Prices are very good and range from $4 to $5.50 for a glass. 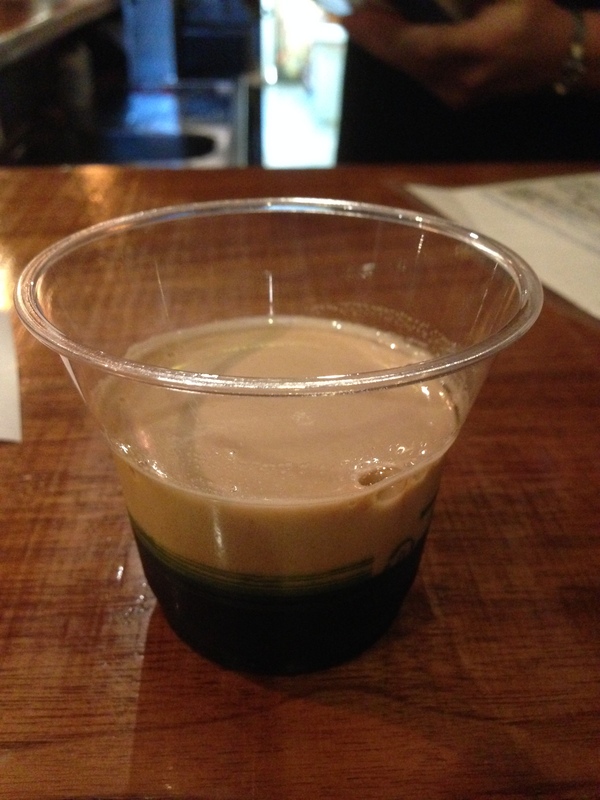 The taster round is 4 for $10 which, of course, this Gal had to go for. Since there were 6 beers on tap my brother and I shared 2 taster rounds and then each picked our favorite beer as the 3 & 4 beers on the second round. To date Liberty Craft Brewing wins for best taster round glass ware. The proper glass for each style really enhances the overall enjoyment of the tasting experience. Hay Stack Extra Pale Ale Neither my brother nor I knew what to make of this one. Didn’t really stand out as a Pale Ale. 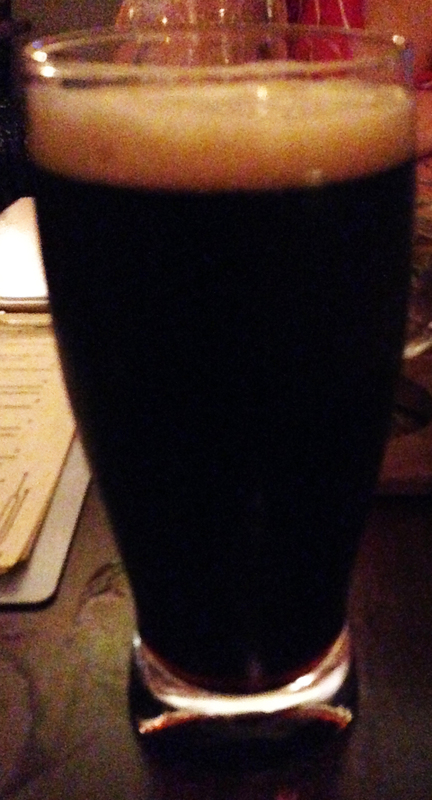 Night Cap Imperial Porter – AWESOME! Of course, it was his Gal’s favorite of the visit. This is a coffee porter so it has that wonderful roasted chicory quality I just love. Blueberry Beah This is an American ale brewed using 15 gallons of fresh local blueberries however, the blueberry taste is very subtle. St George Gold Pilsner A true pilsner, light with just a hint of hops. 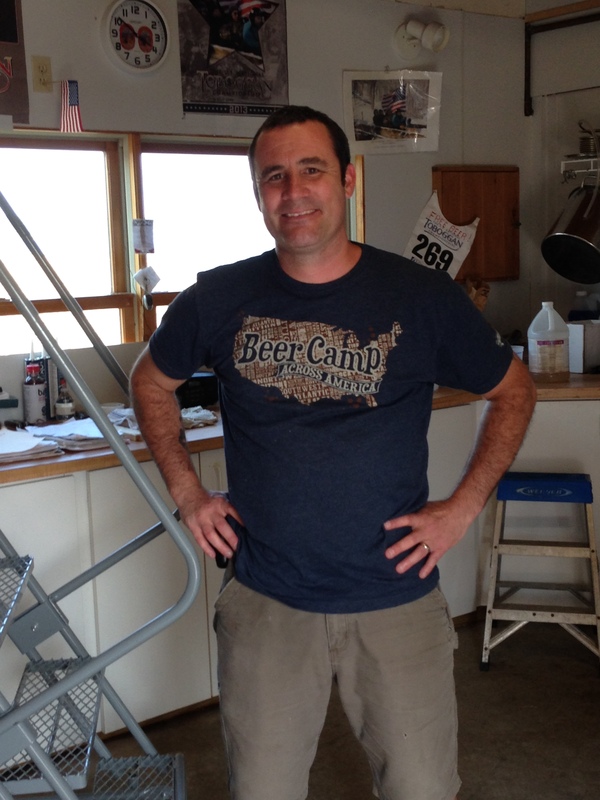 Tunk Spruce Double IPA – Bro’s favorite! Spruce + Double IPA were adding up to something I didn’t think I would enjoy but I was wrong. That’s why it’s important to go outside your comfort zone. You never know what you may discover and I discovered that I really liked this beer. It has the slightest hint of spruce that compliments the hops, over all a very good refreshing beer and a wonderful surprise. Queen Bee Honey Lager – If you like lagers and you like honey this is for you. That being said I’m not a lager fan nor am I big on honey notes in my beer so wasn’t for me. Some of the beer has the young brew taste to it but I think their beer is going to grow in sophistication, after all, they had only been opened 10 months when we visited. 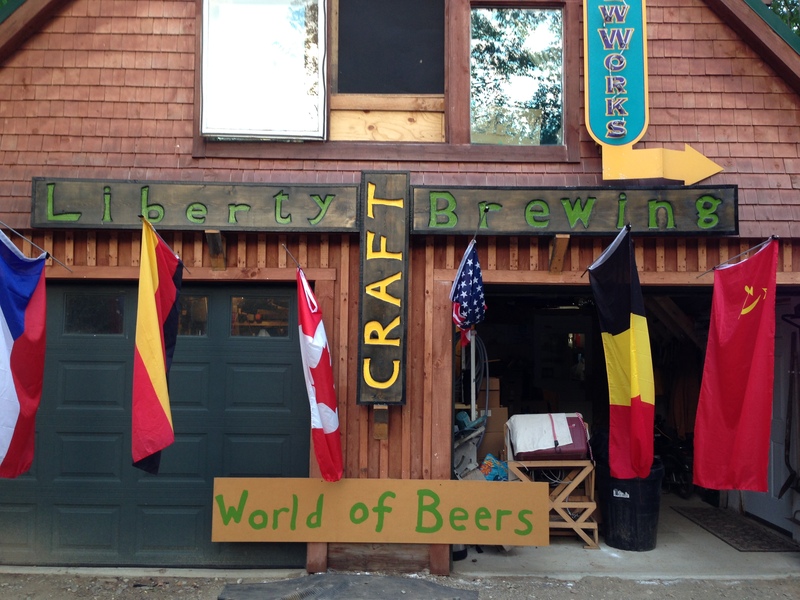 I look forward to visiting again and seeing what sort of growth has taken place at Liberty Craft Brewing. Upon my arrival in Maine my brother informed me he found two more breweries for us to visit Andrew’s Brewing and Liberty Craft Brewing. I hadn’t heard of either but was certainly up for trying them. First up was Andy’s. 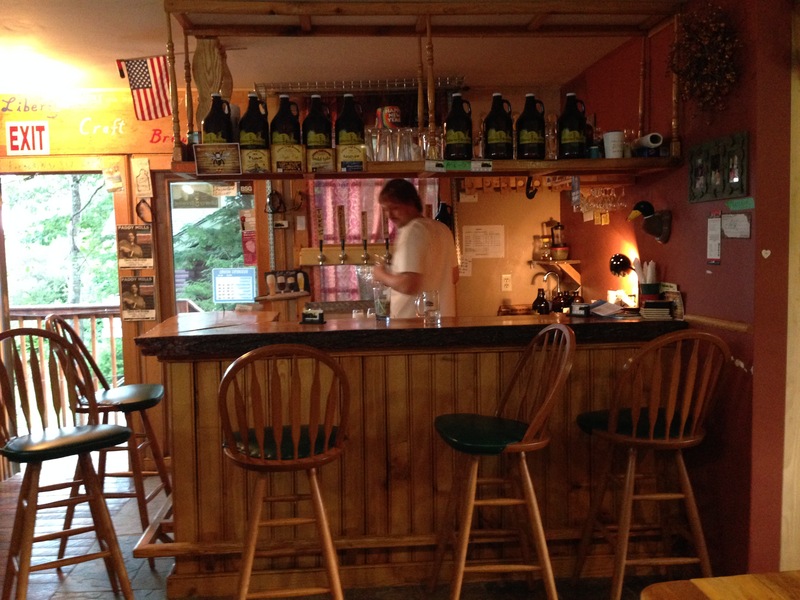 This brewery has been around since 1992 and was one of the early pioneers in the Maine Craft Beer industry. 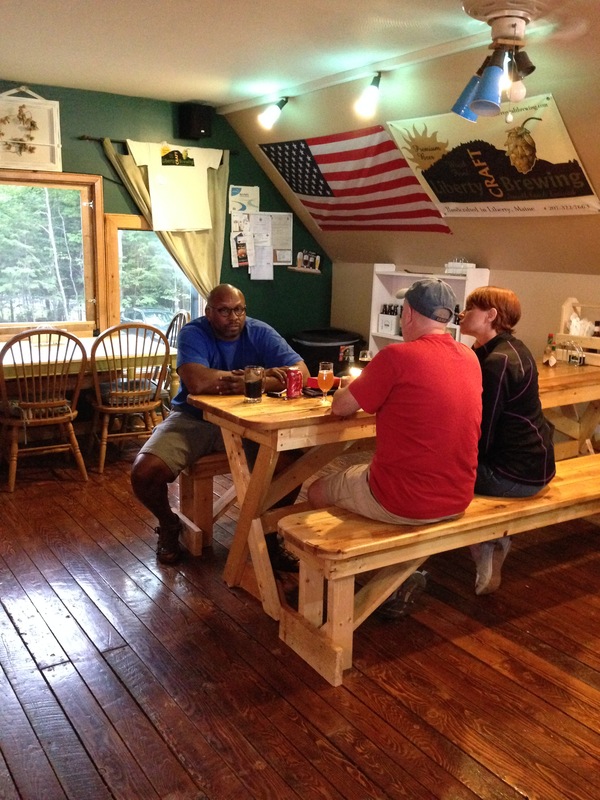 The brewery recently moved into a small building attached to The Lobster Pound Restaurant. 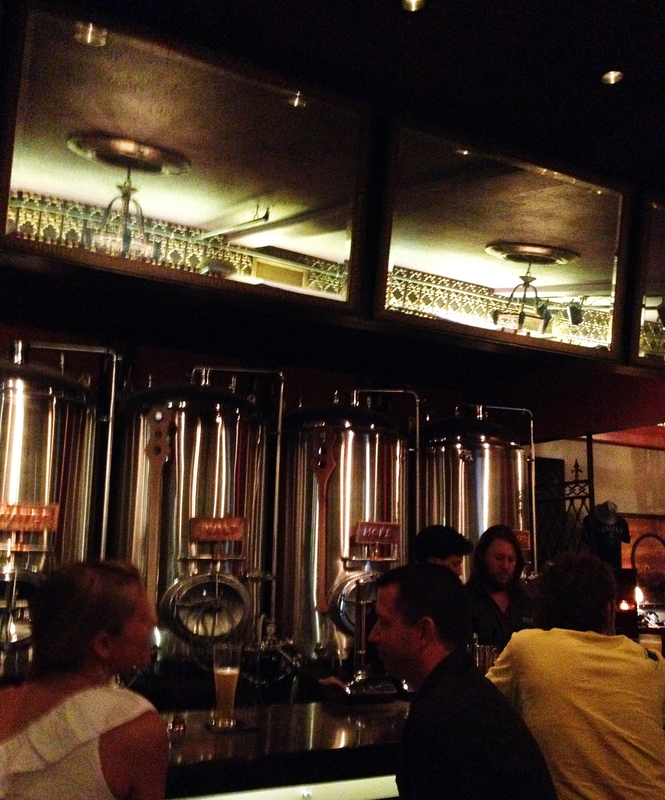 It’s an interesting arrangement, the brewpub is in the restaurant and they are the same but different. Sort of two in one thing. You can also view the brewery from a glass window in the bar area of The Lobster Pound. Upon arrival we took a look at the small, but mighty, brewery set up and introduced ourselves to Ben, one of the brewers, who was friendly and welcoming. I say mighty because they had 11 beers on tap which is a hefty number considering the small size of the brewing area. The brewpub/restaurant wasn’t as exciting. The decor, well it’s lacking something. The wood work is very rustic and beautiful (as in mulled tree truck bar) but the feel of the place is missing something. More color on the walls perhaps. It just doesn’t have that “I want to kick back for a while and hang out” feel that this Gal looks for. It was more of eat, drink and go sort of feel. However, the view is breathtaking and does beg for attention. The brewpub sits right on the water’s edge of Licolnville. I recommend sitting outside and taking in the view – that’ll help with the kicking back part. Plus, the staff and locals are very friendly and it’s easy to strike up a conversation. 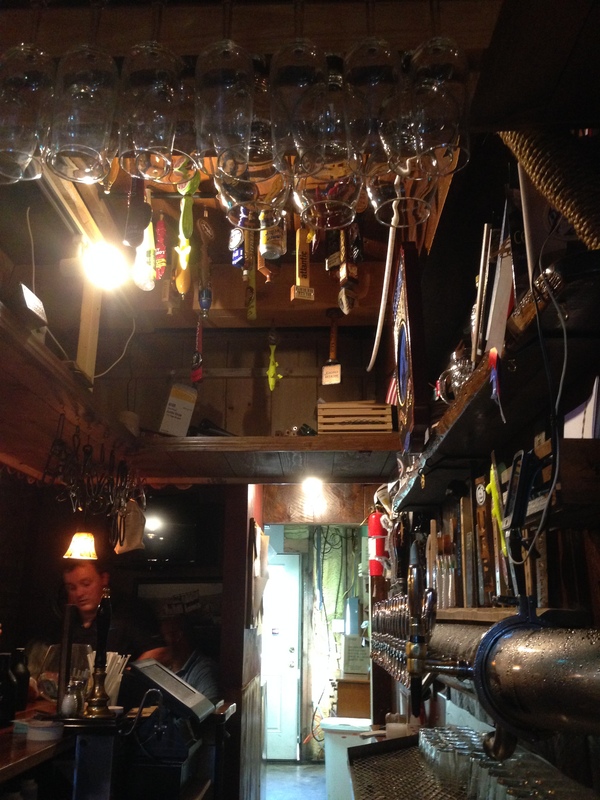 Although, the atmosphere wasn’t necessarily for me the beer was with 11 house beers on tap plus 2 guest taps. The beers are brewed English style and a tasting round consist of 4 4oz pours(pints & growlers are also available). At first I was concerned when I saw pint glasses being pulled from a refrigerator – frosted pints NO! – but upon inquiry I was relieved to hear none refrigerated pints glasses were also available. The breweries preference for serving their english style ales but some locals prefer refrigerated glasses and they’re happy to accommodate everyone – very understandable. Of course, this Gal and her hop head brother had to go for taster rounds. We decided to do 3 rounds so we could try all the beer and the guest tap of mead. IPA 5.6% The standard citrus & hops combo taken down a notch. Enjoyable but not outstanding. English Pale Ale 5.5% Very enjoyable with the usual combo of malt, hops and caramel toasted to EPA goodness. Shandy 4.5% Shandies are one of my least favorite styles but this was a nice balance of lemon and good summer beverage. Gold 4.1% Really good! Normally neither my bro or I are a fan of this style but this ended up being one of the favorites for both of us. Excellent! Red 6.5% Yay a red! Malts, toffee and a slight bitter finish made this another winner. At first my brother was so so about it but tried it with a piece of toffee which complimented the beer nicely and brought the toffee goodness out of the beer. 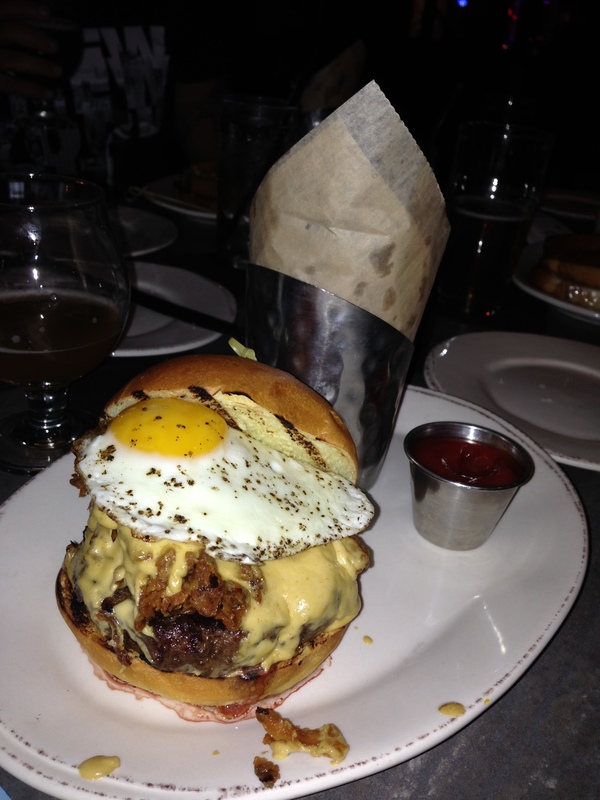 Remember food can really alter your perception of a beer. If in doubt pair it up. Stout 7.8% This was a lighter body stout but, than again, they’re brewing English style beer. Overall the flavor was good it’s just that this Gal’s prefers a bit more chewiness to her stouts. Porter 6.1% A lighter body porter but still tasty with bitter after notes that this Gal enjoys. 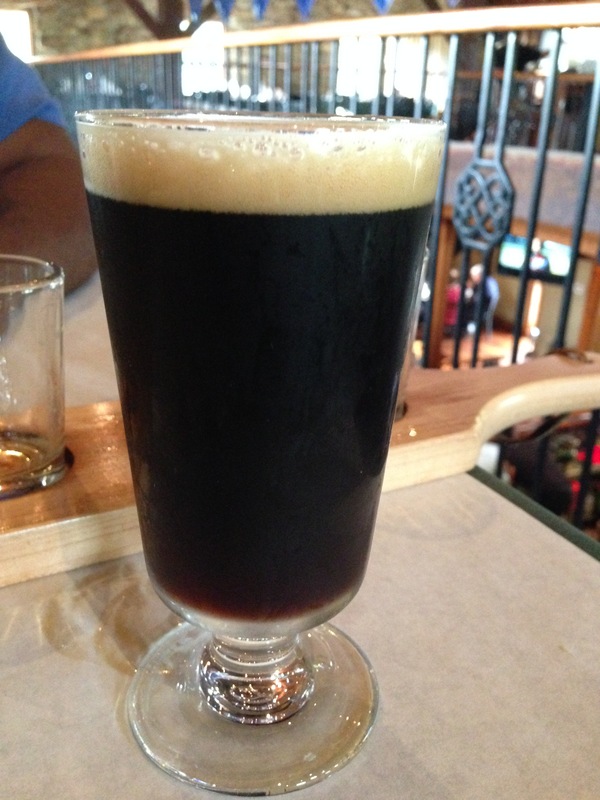 Brown 4.4% – Woohoo a brown! By now you know how this Gal’s feels about browns – always happy to see them represented and this one represented in a good way with baked bread earthiness, toasted malts and accents of fruit. Scottish 5.8% If I see a Scottish Ale on a menu I will pretty always add it to my taster round. I just love trying out this style. This particular one was very well done and ended up being one of this Gal’s favorites for the day! Just the right amount of malt, herbs and subtle smokiness to it. Blueberry– This was blueberry beginning to end from the time it hits your nose and has the follow threw. I’m not a fruit beer Gal (Lambic exceptions) but for those looking for a fruit beer look no further this is everything you hope for and more. So happy to see a black & tan on the menu and this one was a good combo of their porter and pale ale. I later mixed this with some blueberry which helped balanced out the fruit for me. Yup, it’s ok to exterminate with your beers. Don’t be afraid to experiment! Mead the mead was from Michigan on the guest tap and ummm, nope still not a mead Gal. This Gal is certainly interested to see how Andrew’s continues to grow in the brewing world. 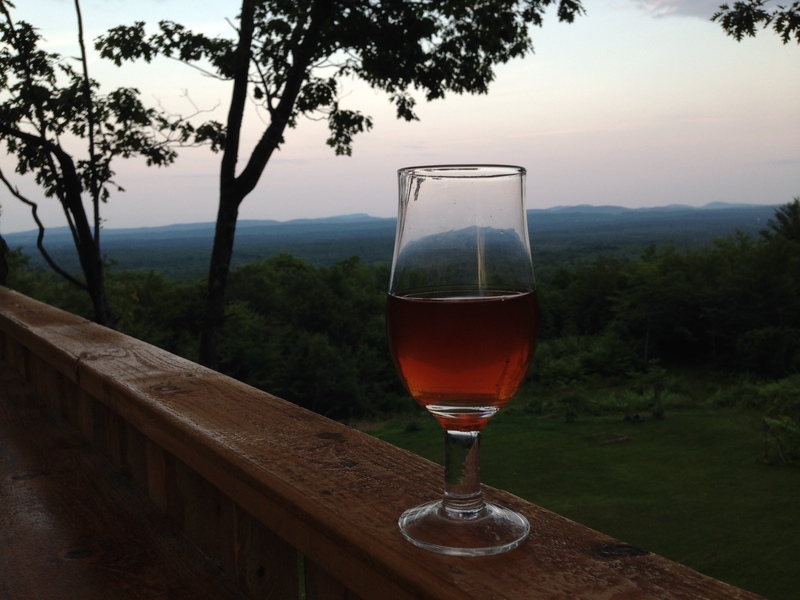 I look forward to a return visit and taking in the view while enjoying a beer. 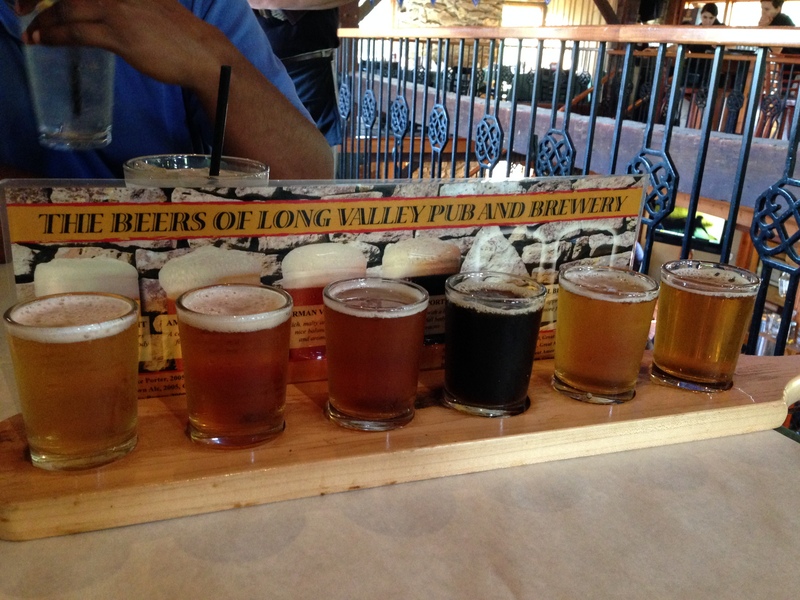 Long Valley Pub& Brewery has been on my list of beer places to visit for a few years. Finally the day arrived for a beautiful fall drive to the brewery. The drive is beautiful and builds the excitement for the final destination. 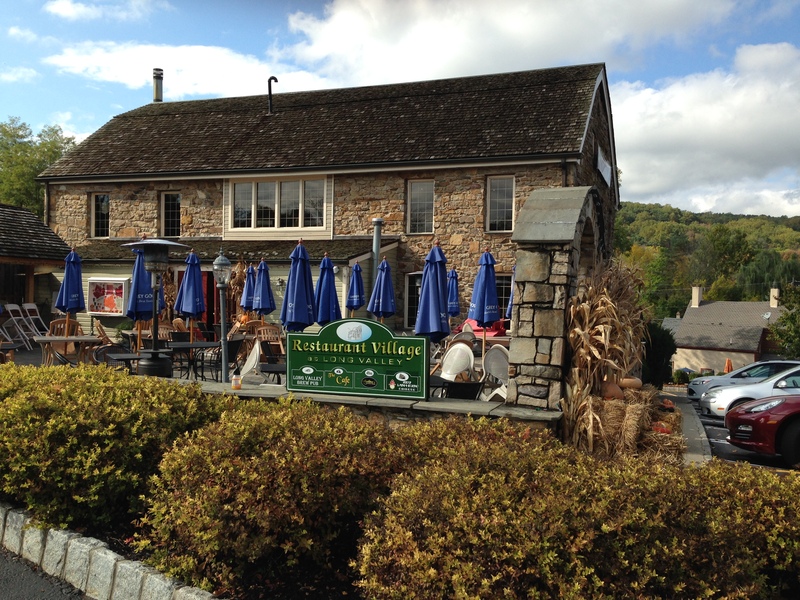 The setting for Long Valley Pub & Brewery is perfect for kicking back with a fine beer and taking in the fall foliage show. 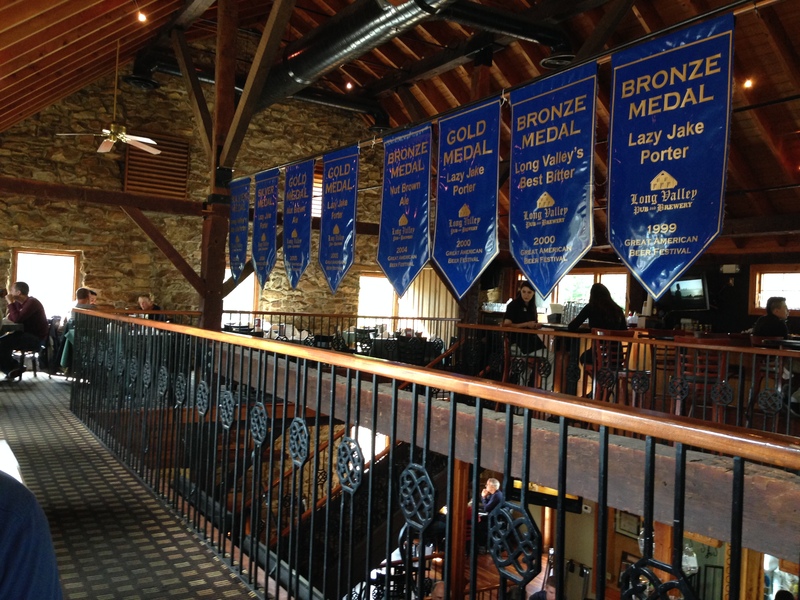 The brewery is very picturesque with outdoor seating/bar area and a rustic ski lodge setting inside. On this particular day the fire place was roaring adding to the overall fall feel. The brewery is 2 stories high with lots of stone and natural wood adding to the overall coziness of the place even though it is actually very large with 2 bars inside and plenty of seating. My companion and I were seated upstairs and fortunately he had a view of what ever sporting event was on the TV and I had a perfect view of the roaring fire. Win win seating. Immediately upon being seat I started to peruse the beer menu and, of course, settled on ordering the sample round. With six beers on tap there was no other way to go. 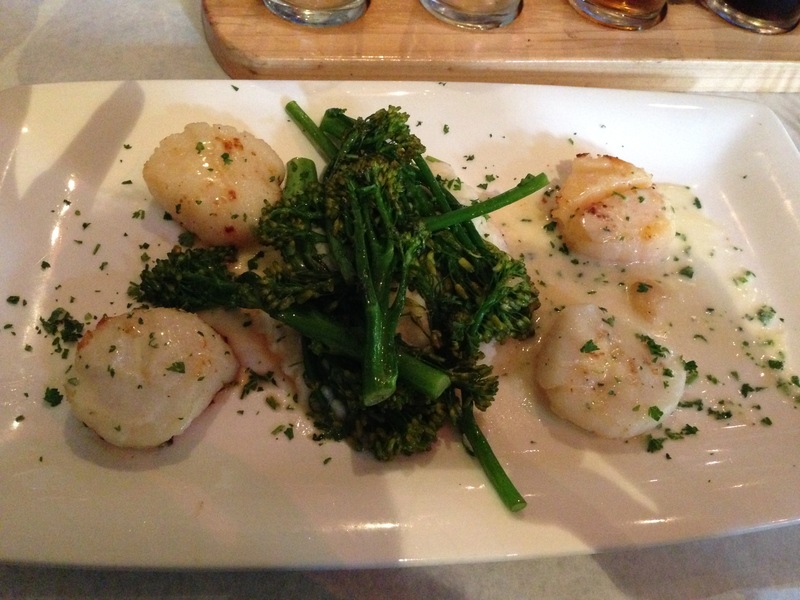 To accompany my beer I ordered the Pan-seared Scallops which were fresh and seared perfectly. I really can’t emphasis enough how good the scallops were. My companion had the French Onion Soup and the Blackened Chicken Alfredo. I’m told the soup had a rich flavor and the Alfredo was delish. High props go out to Miguel G. for excellent service. Delicate light body beer with fruit accents; a true light beer. Well done, very enjoyable without the knock you off your stool hops. This Gal loves German style beers. Good balance of malts & hops with a tinge of bitterness and a finishes strong. Winner of the round! Good hearty blend of roasted barley and malts with accents of hops make this a hearty full body porter. Very light body with some hints of citrus and hops but overall not whole lot going on. Perfect for someone looking for a real light beer or a good intro to craft beer. True German lager – clean and tasty with malts and just a tinge of hops. Would love to have tried the award winning Nut Brown Ale but sadly it wasn’t on tap. Oh well, I guess I’ll just have to go back. 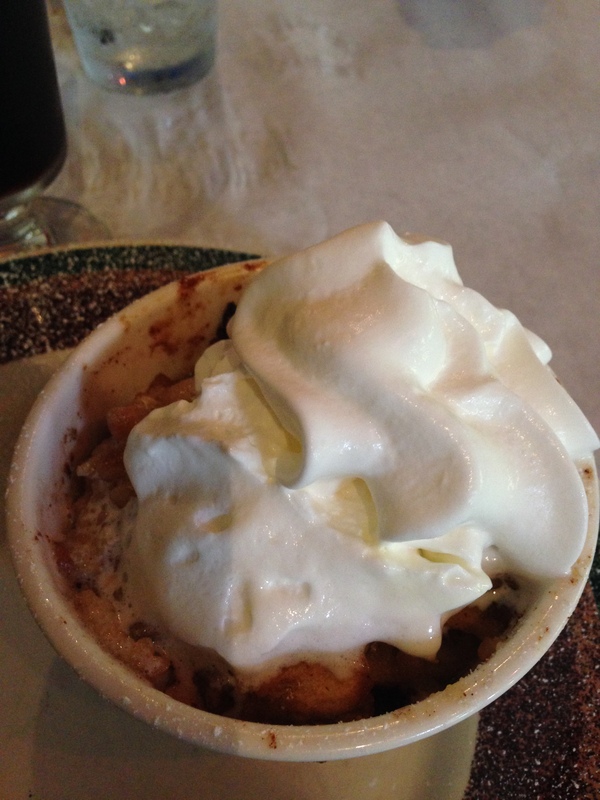 My companion and I, well really me, decided to wrap up the visit with a splurge and treat ourselves to a sweet ending of Fresh Apple Crisp which paired wonderfully with a full pint of the porter. A perfect ending to beautiful Fall outing. After a few days of kayaking and boating this Gal felt it was time to explore some more of Maine’s other great offering – BEER! 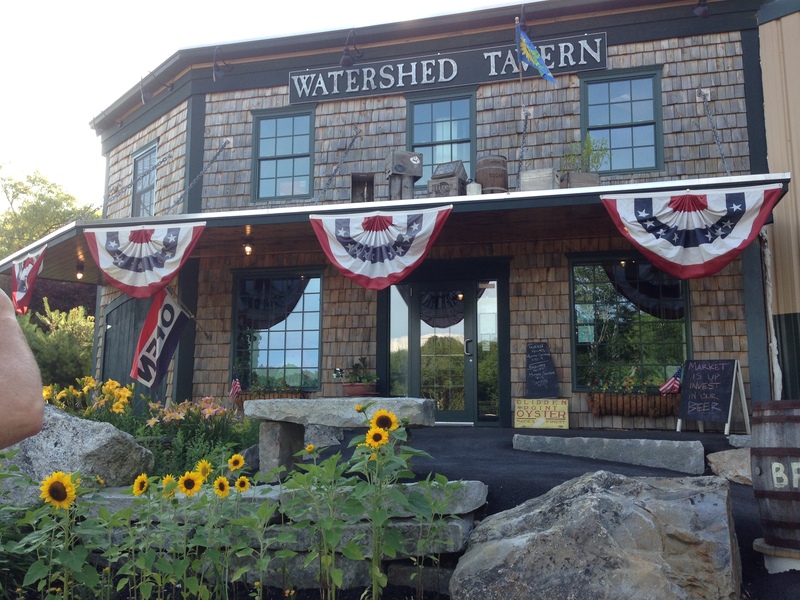 Next tasting stop Boothbay Brewery at The Watershed Tavern. This particular exploration involved six of us including both beer and non-beer drinkers alike. We piled into two vehicles and were on our way until we had no clue where we were. Not one to give up I called to only find out we were a mere minute down the road from the brewery. I feel safe in saying many folk get lost on their way and the brewery is use to explaining how to find them. 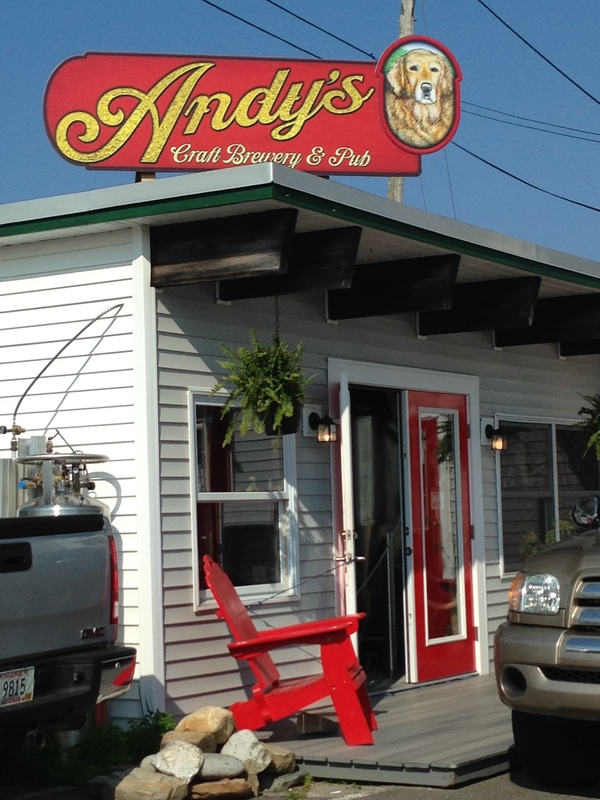 They are not far off the main road to Boothbay but at the same time one would never expect a brewery to be where they are. Once we arrived none of us could believe what we found. 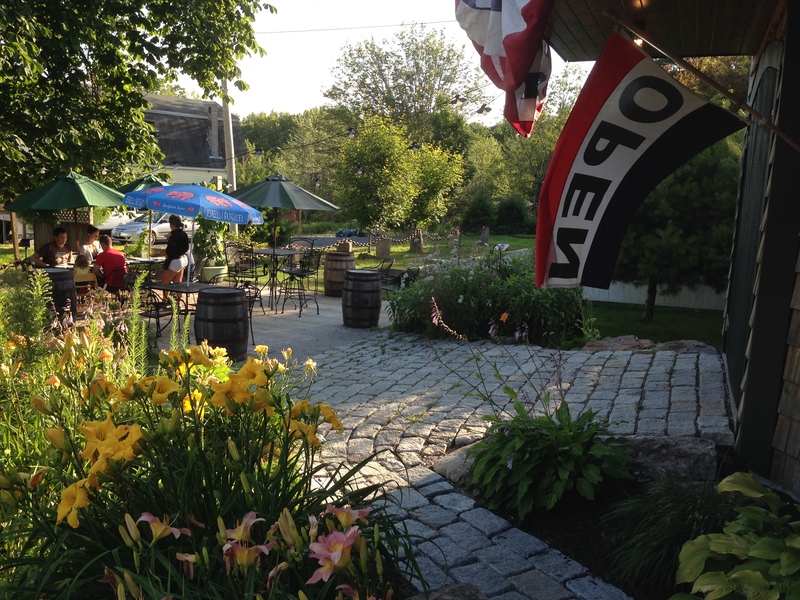 The brewery and attached restaurant are really plopped down in the middle of a back road surrounded by the beauty that is Maine. Not only is there the brewery and restaurant but several small cute cabins scattered about the property for rent. 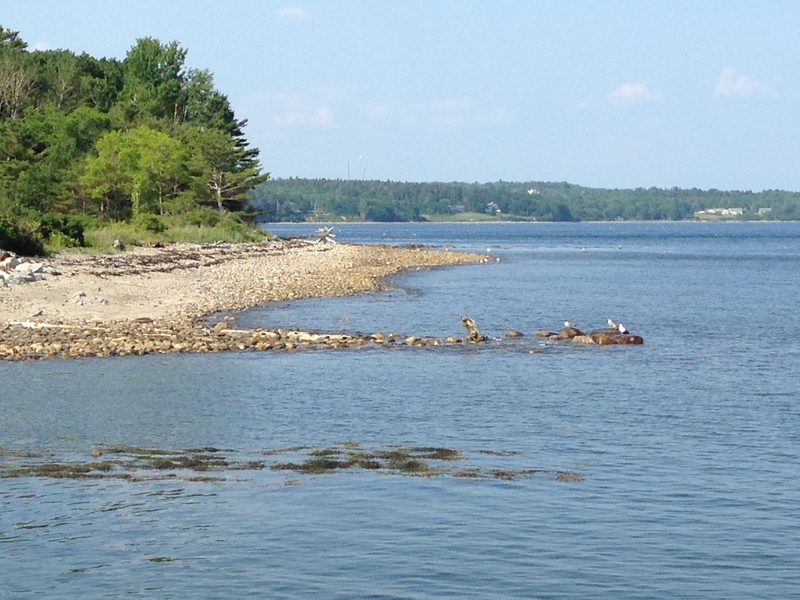 It’s a little slice of Maine heaven that is beautiful and welcoming. The brewery itself was closed by the time we arrived so we wondered into the restaurant, The Watershed. When one walks in you feel like you entered a good friend’s rustic cabin that they built by hand using their own trees which is pretty much the case here. It’s warm, cozy and invites one to stay and enjoy. We decided to plop ourselves down at the bar which meant we took up most of the bar. There are only 8 stool/chairs around the bar. These seats are a piece of carved art with very high backs and extremely sturdy. Around the bar is a small booth and game table ledge with a couple of stools around it. The bar top is a beautiful piece of milled wood. OK, there is beautiful wood everywhere, walls, ceilings, beams, tables, chairs, tasting trays – all of it gorgeous! There is also a handsome brick fireplace in the bar area that I can only imagine ads to the cozy environment in the winter time. Geeky Beer Gal’s Bro suggested we share a taster round since it include 6 large tastes and we were still pretty full from lunch. (there is also a 10 beer taster round) Two others in the party shared a flight as well. The two non-beer drinkers entertained themselves with tavern puzzles available at the bar for patrons to enjoy and drive themselves crazy with. The Watershed offers both beer and wine but no hard liquor. 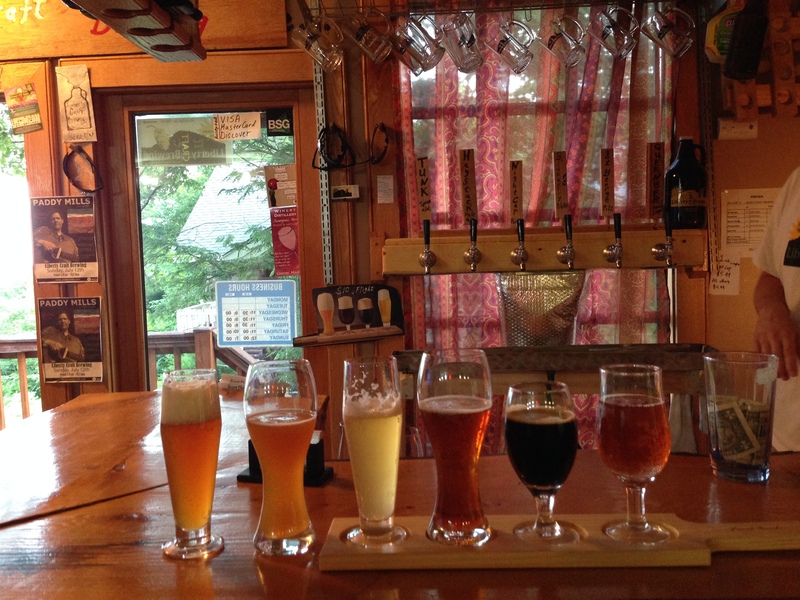 They do offer a few selections from other breweries, as well, such as Dogfish Head and Allagash. A true pale ale and happens to be their flagship brew as well. This ale has some good quality malt tones that help counter balance the hops. Right away one can tell they are using American west coast hops which helps me to distinguish one pale ale from another. To me American West Coast hops are a breed unto themselves with a very distinct characteristics that sets these beers apart from the rest of the hop pack. The hop factor was a bit much for me so not a favorite but a very well done pale ale. Sweet malty goodness! This ale has a nice dark roasted coloring but the body is on the lighter side for a brown. Great mix of malts with accents of hops and a good nutty flavor. Enjoyable indeed. Hop overload for this Gal but the Bro enjoyed it. A hoppy red ale true to style with some caramel undertones making its way through the field of hops. More and more I find myself enjoying the Black IPAs. I just find them to be a really nice balance of malt and hops and easy to drink. This certainly was the case with the Devil’s Thumbprint. It was so well balance that both myself and my bro enjoyed it! A good medium body English style ale with a pleasant mix of fruitiness, hops and malts. Very light in body, nice wheat beer with hints of citrus. Good intro beer for someone just starting to get into craft beers. First tried this after tasting the Black Rocks Stout and felt it was good with just hints of vanilla. I tried it again later on in the tasting and wow the vanilla really punched its way through. Nice porter body but the vanilla was bit overpowering. While enjoying the beer we all took notice of how delish the food looked and smelled. A nice touch was the chef retrieving some beer from the taps to cook with. 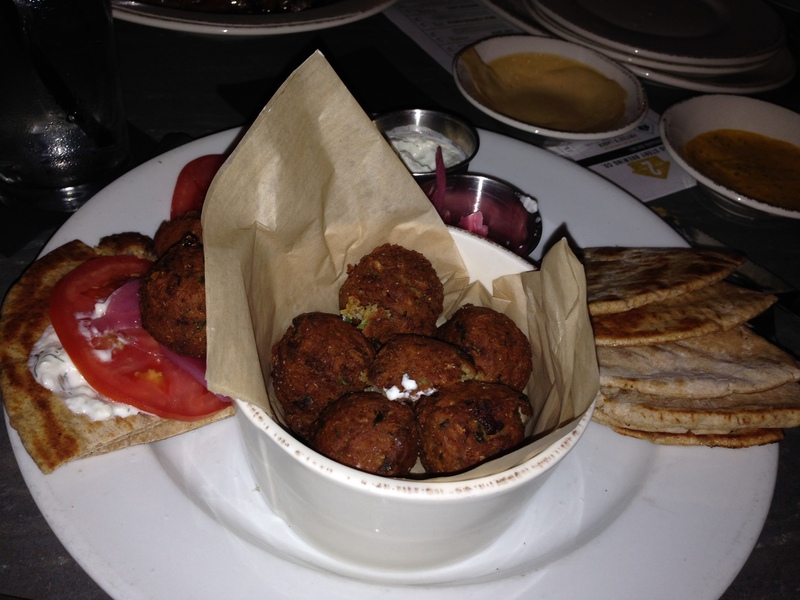 The menu is true tavern fare with both meat and vegetarian offerings. On the way out we spotted fish and chips being served to a patron and none of us could believe the size of the dish. 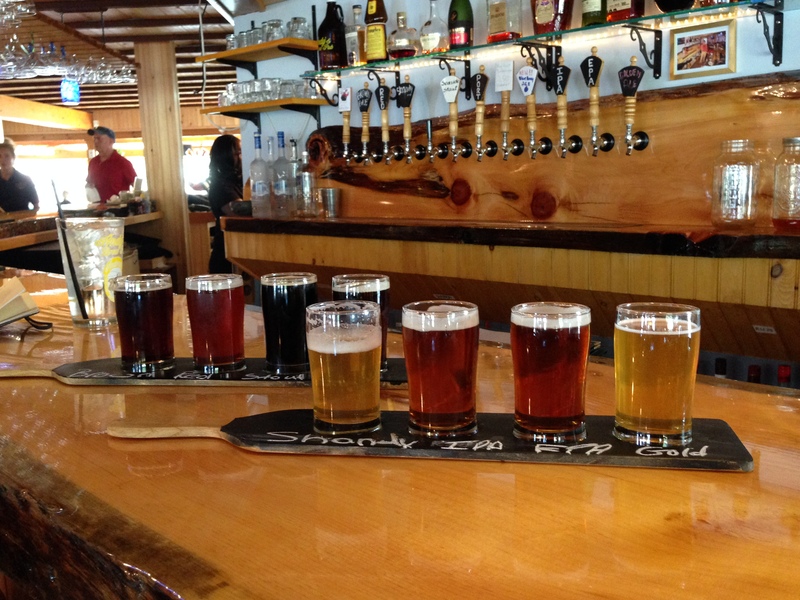 We all agreed we’ll have to pay another visit to Boothbay Brewing so we can try out the food and enjoy some more beer! A couple of weeks ago this Gal had the pleasure of meeting a dear friend at Vault Brewing for an evening of drinking, eating and catching up. Don’t you just love friends that you can pick up right where you left off even if it’s been months? This was my fourth visit to Vault Brewing and I find it just keeps getting better with each visit. When the Vault first opened the beer was young, the food was fine but nothing to write home about and the seating, well, not the most comfortable. I’m happy to say all that has changed. Gone are the uncomfortable tractor seat things and in their place comfortable chairs, the bar now has stools were there was no seating before, the food is delish and the beer has matured and is down right tasty! 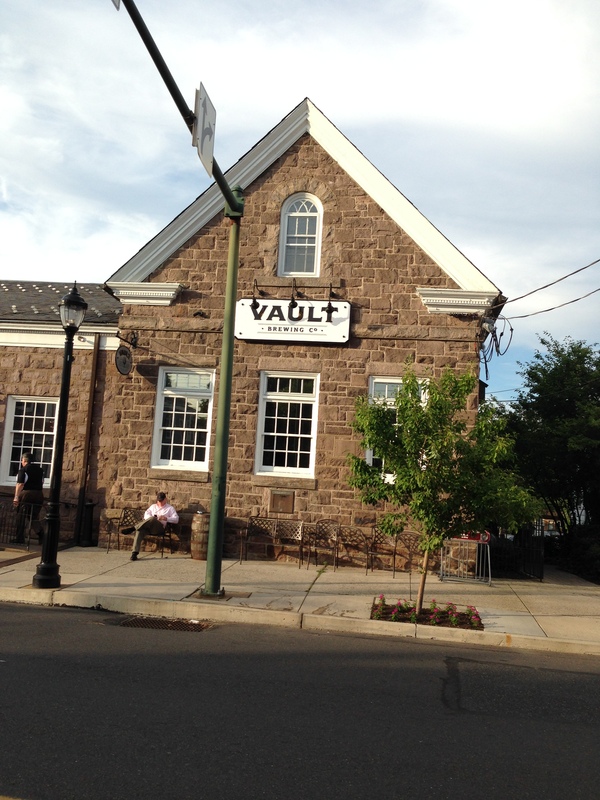 Vault Brewing is located in an old bank in Yardley, PA that Geeky Beer Gal’s parents used to bank at so I remember being in the building as a kid/teen. It’s nice to see it recycled in to such a cool place. The atmosphere is warm and cozy and the wood-fired kitchen is in view as soon as you enter the establishment as is the brewery. There are rooms off to each side of the bar area and a wonderful patio for outside drinking/dining. There’s parking out back but it’s limited and parking in other lots could result in towing. You’ve been warned – read the signs. There was a nice crowd for a Friday night without being overwhelming. I’ve heard most Fridays here are packed but we lucked out. No wait for a table unless one preferred patio seating. My friend and I opted to sit at a table in the bar area. One of the things I love about the Vault is it’s designed for socializing. Meaning that there are no TVs (woohoo) and the music is cool. On this night there was a fantastic trio, Mike Billingsley, playing near the entrance. Great trumpet, this Gal loves a trio that includes trumpet. After looking over the beer list I decided to stick with the usual format of enjoying a taster round. Once the beer was ordered it was time to peruse the food offerings. The menu isn’t huge but has something for everyone with interesting offerings. We started with the Buffalo Cauliflower, think Buffalo wings done with Cauliflower, so yummy! My friend had the Crab Cake Sliders and I was told there were very good. I decided to go for my sister-in-laws favorite dish at Vault Brewing the Wild Mushroom Flatbread – incredibly wonderful and just as good the next day reheated. Now for the beer! There’s usually 5 or so beers on tap and the offerings rotate so there is a beer no matter your taste and always something new to try. This beer has nice bit of heat from the spices but was well balanced by the citrus and coconut. Don’t panic about the coconut, this is not a sweet beer but rather light and refreshing. Really a pleasure to drink. Something about the carbonation of this beer reminded me of pop rocks with cola. Basically, it was fizzy but enjoyable. Nice combination of fruit, hops and caramel. I’m always up for trying a bitter even though I’m now a huge fan of the style. This is a particularly well done Bitter. The cask caught my eye so had to add it to the round. For a non-hop head this was a really enjoyable IPA. This beer is a perfect balance of both malts and hops. With the hops being present but not overwhelming. They don’t over power the malt and fruit tones but rather compliment them. Good morning, and yes I believe one could drink this in place of their morning cup of joe. The coffee is very up front and wonderful. A wonderful stout down to the last drop! Great roasted malt, coffee and chocolate flavors going on. Super delish! My favorite of the round. My friend and I decided to enjoy one last beverage for the evening. A Sangria for her and the American Stout for myself. Somehow I missed the American Stout the first time I studied the menu otherwise I would have added it to the taster round. Beings it’s a stout I felt secure that I would enjoy it and ordered a full pint. This brings me to the one down point of the evening – service. When one has trouble finding room on a table to set a beer down instead of trying to rearrange the dirty glasses and plates just remove them. Finally, my friend and I took it upon ourselves to remove the dirty dishes and place them on the table next to us that hadn’t been cleared yet. I find table service here to be hit or miss, which is a shame, because everything else at Vault Brewing really is a hit! Now that we made room for our drinks we were able to sit back and enjoy them. This is a well done stout but I wish I had tried this stout before the Kenyan Coffee Stout. The American Stout has a slight roasted coffee and chocolate offerings but was overpowered by the flavors I experienced with the Coffee Stout. I would like to try it again on its own without my taste buds first experiencing the Coffee Stout. 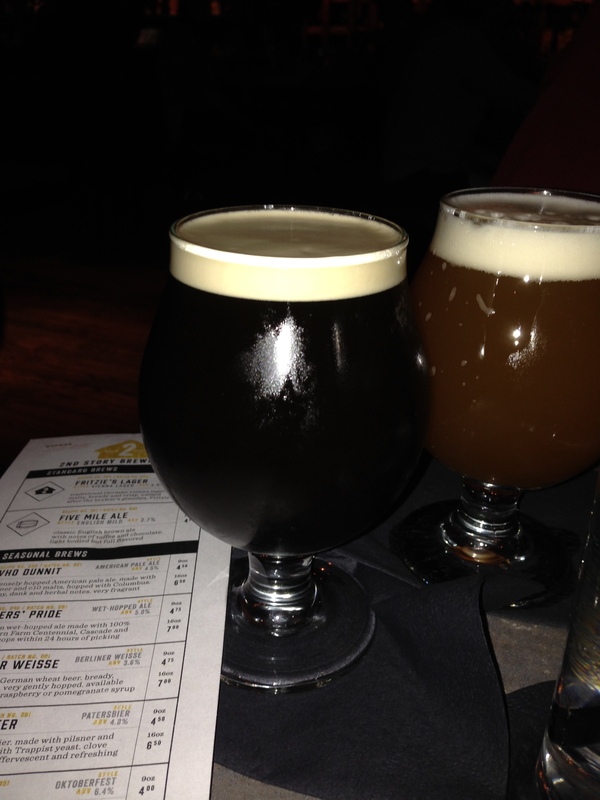 It was a wonderful evening at Vault Brewing catching up with a great person while enjoying wonderful beer. 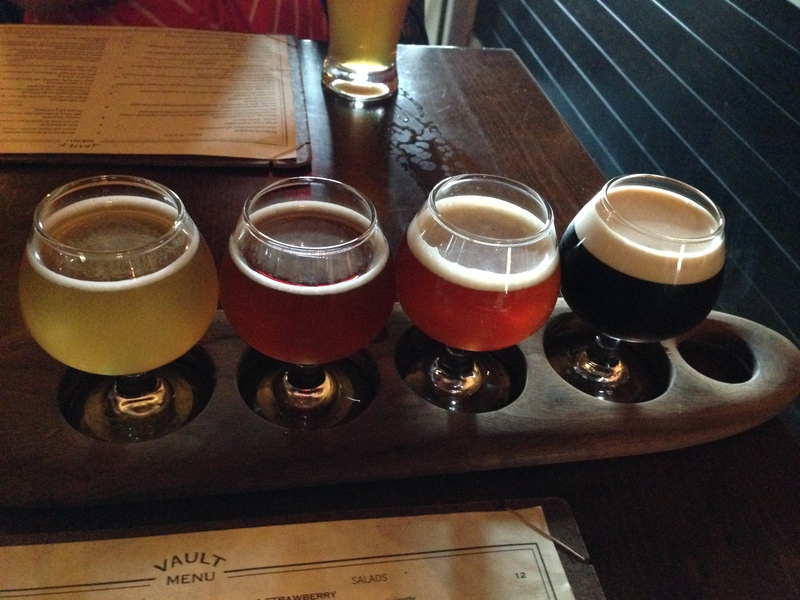 Vault Brewing is a fantastic addition to my childhood town of Yardley!